Kevin Hillstrom: MineThatData: Hire Kevin! Have a project where you need Kevin's help? Yes? Good! Here are the many ways that you can work with Kevin. On all projects, Kevin bills half of the project fee up-front, half is due within 15 days of project completion. A typical project takes 3-4 weeks to complete. Send Kevin an email (kevinh@minethatdata) or call at 206-853-8278 for details. This low-cost methodology identifies why business has not performed to expectations. Kevin will investigate channel-based issues, merchandising issues, pricing issues, and general productivity challenges to identify why a business is not meeting expectations. You will receive daily "tidbits" that explain what Kevin is learning, followed by a paper outlining what is wrong (hint - merchandise challenges are usually the issue) and how to potentially fix the issue. You'll get the most popular elements of a typical "Diagnostics", "Merchandise Forensics", and "Fix It" products. This is the NUMBER ONE project request I now receive, and for good reason!! Annual Sales of $1 to $29,999,999 = $15,000. Annual Sales of $30,000,000 to $99,999,999 = $25,000. Annual Sales of $100,000,000 to $999,999,999 = $35,000. Annual Sales of $1,000,000,000 and Greater = $50,000. A comprehensive targeting strategy that allows you, the marketer, to know who to target for email marketing campaigns (based on merchandise preference). You get your own customized weighting strategy based on a regression model of customer behavior, and you'll get a "targeting cross-reference" table that tells you which merchandise categories align with each customer. When programmed into your database, you will know who to target and how to target them, from a merchandising / email marketing standpoint. In addition, you will receive dozens of "targeting variables" that allow you to personalize email contacts to customers. It's common to see +/- 20% gains in email marketing performance when using targeting variables. 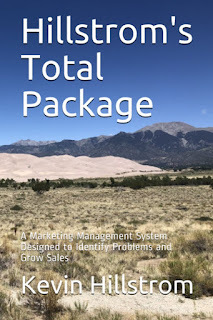 If your project doesn't fit nicely into the "Total Package" framework, I'm happy to work on it anyway! 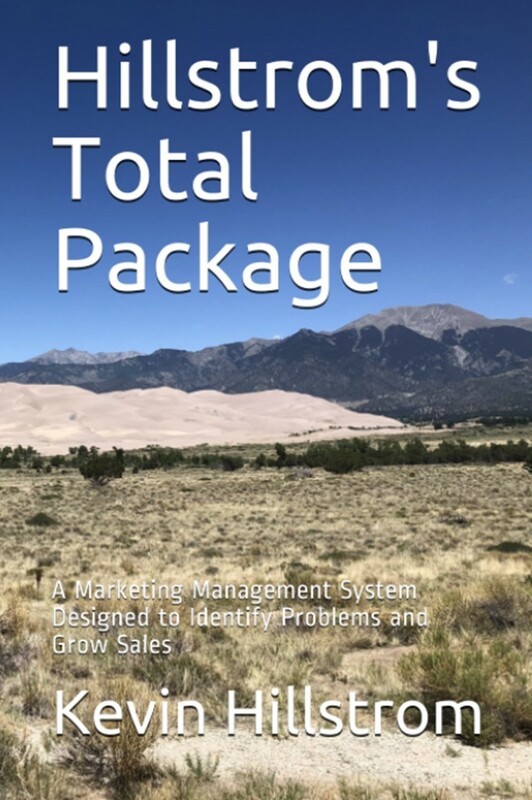 Look to the "Total Package" pricing for Ad-Hoc Project pricing, ok? Annual Sales of $1 to $29,999,999 = $17,000. Annual Sales of $30,000,000 to $99,999,999 = $30,000. Annual Sales of $100,000,000 to $999,999,999 = $40,000. Annual Sales of $1,000,000,000 and Greater = $55,000. Buying A Company? Selling A Company? Send me five years of purchase history from the company you are thinking of buying/selling, and I will give you an unbiased view of the potential of the customer base to deliver acceptable sales/profit levels in the future. I combine my Fix It methodology with Buyer/Seller specific requests to properly measure how customers are actually behaving. Is the merchandise assortment acceptable? Are enough new customers being generated to fuel future growth? Does the company have a viable new merchandise strategy? Is comp segment productivity increasing or declining? Three times a year Elite Program participants learn how their comp segment productivity is trending. They learn how good of a job they are doing at reactivating buyers and acquiring new buyers. They also learn about aspects of their business based on experimental methodologies that Kevin is playing with. First Run = $1,800, prepaid. Each Subsequent Run = $1,000 prepaid. Runs occur in February, June, and October. Invite Kevin to Visit Your Campus! Kevin frequently visits clients for day-long sessions designed to fix various business problems. Visit Cost = $4,000 per day. Client pays for Economy-Plus airfare and all applicable travel expenses including hotel, car rental, parking. Kevin occasionally partners only with Leading Brands on a retainer basis. The client purchases hours on a "use-'em-or-lose-'em" basis. Retainer Cost = $20,000 per 7 Days of Work, use it or lose it, prepaid. Kevin has been featured at major conferences in Germany, Sweden, UK, and the United States, as well as Shop.org and Internet Retailer. Speaking Fee = $4,000, plus Economy-Plus airfare and all applicable travel expenses. The image below illustrates what a typical project dataset looks like. Most projects can be completed with just "File #1". 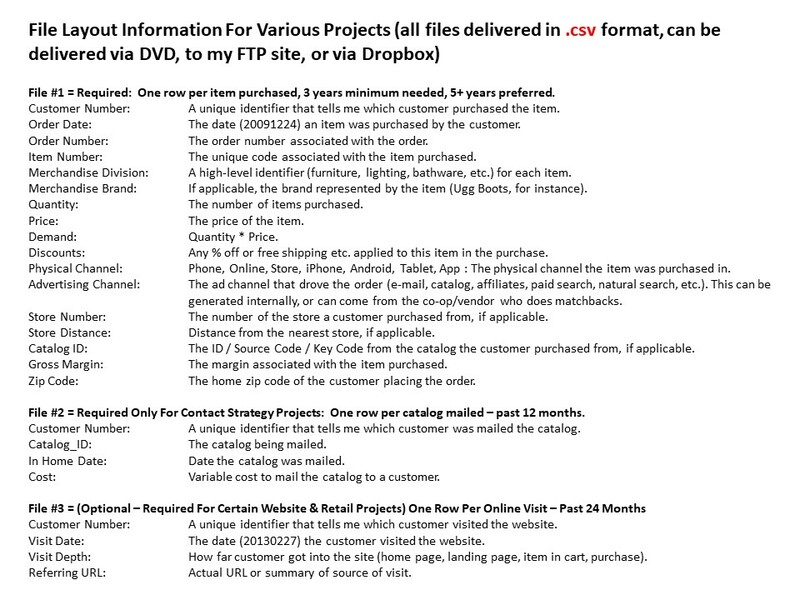 Most e-commerce / mobile projects require "File #3". Most catalog contact strategy projects require "File #2". Files must be formatted in .csv format. I can offer credentials for an FTP server if required.